Rarely these days, does a film have packed houses, even on the first weekend. At the late night show on its first Saturday, when I saw a packed house for Kahaani, I could sense two things: that Vidya Balan gets an initial, at least in the aftermath of The Dirty Picture, and that the initial reviews of the film must have been good! I was motivated to take that late show because of a few good reviews from friends, on Facebook. And I was not disappointed at all. The movie has an interesting story. Just the right amount of intrigue and anticipation, that bit of suspense. And yet not stretching..
A well written script in short, and beautifully enacted by all actors, and especially Vidya Balan. Yes, Vidya. She’s clearly taken on the mantle of the thinking heroine of current times. Who waits for, and gets interesting scripts, and then delivers on them. A Shabana Azmi or a Tabu of earlier times, I’d say. 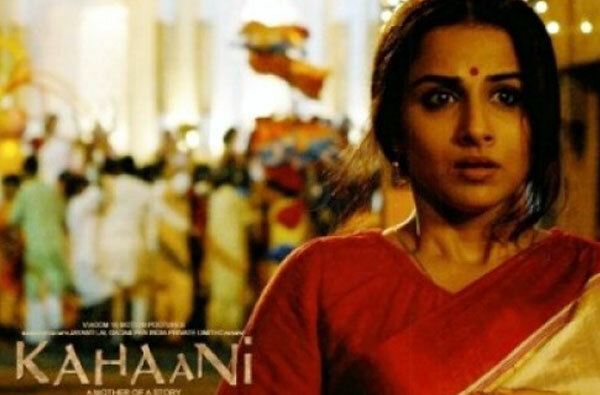 Kahaani is another opportunity for her. A film that rides totally on her, and yet has some other support actors who also put up good, credible performances. Kolkata is definitely a star of the film. The bylanes, the puchkas, Victoria Memorial, Howrah Bridge, the trams, the metro.. all of these are prominent. And of course, the Puja. When the city immerses as a whole. The preparations, the decorations, the white saris with the red borders, and the characters of the city, from the bored policeman to the young kids smiling and working hard.. yes, Kolkata is a star and also speaks very well, in the film! The story as you may be aware, is that of a woman coming from London, looking for her husband, who has gone missing in Kolkata. With little support from authorities, she still chugs along relentlessly, and that is what the movie is all about. Won’t spoil it for you, by saying more. There is an interesting character of a contract killer. Quite creepy, in fact. One of the highlights of the film has to be Amitabh Bacchan’s rendition of the popular song, “Ekla Chalo Re”. As it is, Bengali is a beautiful language to listen to, and then, it is made priceless by Amitabh’s amazing voice, on this song. Finally a few words about the director, Sujoy Ghosh. For me, a film is all about the director. His vision, his creativity, his obsession on getting the detail right. And Sujoy Ghosh gets it. He is an Engineer and an MBA, studied in London, spent time in Mumbai and Kolkata. A 46-year old. Not trained in cinema. Learnt all he knows, from watching Satyajit Ray films. 1. He asks Vidya to go and walk in the crowd. Without hesitation, she goes ahead and does that. Only when cameras are seen, do people realize that shooting is going on! 2. In many scenes, they don’t tell Vidya when she needs to get up, move etc. The cameras are set, and they just follow as she gets up, moves, etc. Amazing.. Overall, my recommendation on the film. Definitely worth a watch. You will find time and money well spent.. ! P.S. : I could have used another (bolder) image here, but I am not about to use Silk to ‘sell my blog’.. lol. Ishqiya has stamp of Vishal Bhardwaj all over..